I wasn’t quite sure what she meant until I got back to my hotel room and found a nice bottle of Pommery Brut Champagne resting on ice, a gift from the hotel for me having to change rooms (twice) very late in the evening due to a mechanical problem on my floor. And that, my friends, is a perfect example of Swiss hospitality, and that’s how you apologize to guests. After I spent the day touring the ripening caves for cheese up in the mountains in preparation for my upcoming tour, once back at the hotel, I wasn’t all that hungry because I’d been eating all day. And it wasn’t just all day, but upon arrival I had a bit pot of simmering fondue and that has been keeping my company, in my tummy, for the last few days as well. I knew they had a lot of cheeses in Switzerland, but someone please remind me that I don’t need to try them all. But who doesn’t have room for a few glasses of ice-cold Champagne? Because I didn’t want to be rude and not drink it, dinner was a gathering of items that I had on hand (since I once I put on a big, fluffy bathrobe, it takes a lot of incentive to get me to take it off), which consisted of Champagne, meringues, and La Gruyère double cream. It wasn’t until I dipped my knife into the thick cream, smeared it on the underside of a meringue and popped it in my mouth, did I understand what the locals were taking about and the dangers it would involve. The whole thing literally dissolves when you bite down and the über-thin meringues shatter into a million tiny bits and disappears, leaving nothing but a trace of sweet. 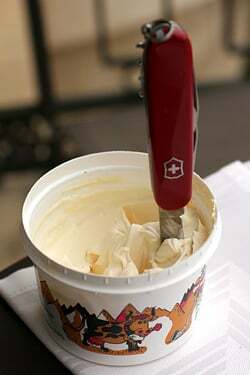 What’s left is the smooth sensation of creamy-rich butterfat from mountain cream. 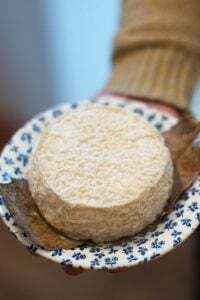 And even if you live in a country where crème fraîche of the highest quality is readily available, this cream is a whole ‘nother animal and it’s impossible not to want more. It’s somehow both light and rich at the same time. A local chef told me the cream must be at least 45% butterfat, but my knife doesn’t lie and I am certain this was much higher. (I didn’t check for sure because I didn’t really want to know.) You’re supposed to dip the meringues in the double-cream or pour it over berries, but from the looks of things from my pot, I don’t see how that’s impossible. For all you non-locavores, you’ll have to convert if you want to try this double cream since it’s a specialty of this region. And, of course, you can’t get double cream from Gruyère unless you’re in the region of Gruyère. 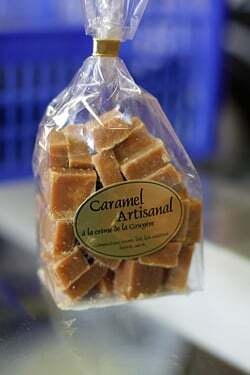 I hit another cheese shop this morning and although I didn’t pick up any more meringues, or another pot of double cream, I did eye this bag of caramels made à la crème de la Gruyère, which I’m planning on trying. But I’m waiting for a bottle of Champagne to arrive. Which is why I’m sitting in my hotel room, wrapped up in a bathrobe, waiting for a knock on my door. Oh la meringue double crème…Yep, I know that one too…I also put double crème on my strawberries or chocolate moelleux…Vice! Oh my goodness. This looks divine. Fondue doesn’t sound half bad either! Perfect example of ignorance being bliss. I wouldn’t want to know the fat content either! Looks delicious! I had a similar feeling when we were in Turkey and I tasted kaymak – a rich local cream made with buffalo milk. SO rich and yet light – it was almost heaven. I ‘m pretty sure it was 60% or more butterfat but lets not go there. Mövenpick makes a Gruyere double cream and meringue ice cream that you need to try. You should probably be able to find it at any Coop in Switzerland. Of course, I’m sure it’s not as good as fresh meringues with real double cream, but it has that same texture, leaving you with a finish of faintly sweet, rich dairy fat. Now I feel a fool to have never had it with champagne. Oh dear. I’m completely sold. Next trip is definitely to Swizerland! What. no meringues and crème de la Gruyère in your room? No caramel either? I know what I am going to get on my next trip to that part of Switzerland, thank you for the tip! Wow, that is so decadent. David, I’m definitely jealous of you. I need to start thinking about visiting Europe now. Oh my goodness! Yes! I tried Gruyere Double Creme when I visited Gruyeres a few years ago…I believe it was served with those beautiful meringues AND berries. I had almost forgotten about it until I saw your post. Where else will you be visiting in Switzerland? Twenty odd years ago ,while visiting the Jura with a group of my students, we were served a huge bowl of what looked like very heavy cream with fresh berries.Needless to say, my Inuit students and I, devoured two bowls amongst us.Could that have been double creme? 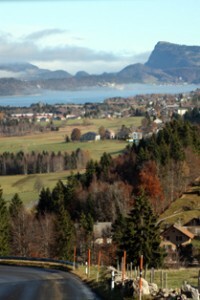 …I lived en Suisse for 17 years – I’m homesick reading your post. Enjoy! – S.
Haha, this is so true. And knowing that I can pick up both meringues and double crème at my local Migros whenever I want makes it even more dangerous because the temptation is always there :) Seriously this is one of my favorite Swiss desserts, and it’s even naturally gluten free! oh, have you tasted mövenpick’s ice cream flavor – double crème de la gruyère & meringues ?? By the way, just finished “The Sweet Life in Paris,” and I enjoyed it very much. Thanks for making me laugh! Fluffy bathrobes? Champagne? AND meringues with Gruyère double cream? That must truly be the definition of heaven. i’ve literally just copied and pasted this link into my fiances browser and told him i want to reconsider new zealand for our honeymoon. this is the first time i have commented on your blog (i am WELL overdue…i have been reading forever!) but i could not help myself when i saw this. it looks about the most fantastic thing i have ever seen….i love meringue in many forms but would never ever think to top it with gruyere….and double cream at that! i am sitting at work now and all i can think about is champagne and this cheese! le sigh! Fluffy bathrobes, champagne, meringues and double cream gruyere? Yes please!! You will get no help from me … I think you DO need to taste every cheese in Switzerland. Hope your champagne shows up soon. Your columns MAKE MY DAY!!! Keep traveling, keep eating but most of all: keep writing!!! 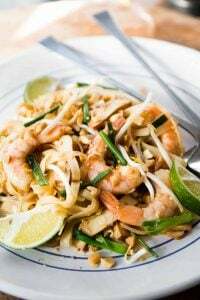 You got me with this one – it’s addictive! I live in Lausanne… and have a map in my head that spots each place in the city where you can order meringues with La Gruyère Double Cream for desert! So what did they do with all the yolks? Perhaps they should start making Gruyere ice cream. I have a acquaintance who owns an ice cream parlour where the ice cream is made from a real egg custard base, so he makes meringues as a by-product with all the egg whites. Tina: I didn’t make the connection. Thanks for doing so~! Katherine: Yikes, these things are dangerous. That cream is amazing. If I lived near it, I’d be a lot happier. And heftier. kylie: That’s funny because I said today, “This place is like France, but without all the problems.” So I guess it’s not the paradise it seems. But nowhere is perfect – and this is sure a great place to visit. Can’t wait to come back again. Stefanie: Glad you liked the book so much – thanks! Daveed dear, your words are salivatingious. Really. That was such tasty reading! Well you just blew my last blog post out of the water — I wrote about love and addiction and desire and needs and now I would love to rush right out to the store to get the stuff to make (an American version) of these so that I could have a new addiction . . . they look better than a bad man in a good bed. Hmm. I seem to recall pictures of a couple of rather hunky cheese-makers in an earlier post. After a couple of glasses of Champagne, perhaps they could provide a suitable incentive. love this post! your cheese/dairy posts usually make me exclaim something out loud, and this one was no different. the idea of la gruyere double cream will haunt my dreams. thanks for the great post! I normally don’t like sweet or rich things but now you leave me hungering for this. They don’t export the stuff? The cheese itself sounds delicious. The cheese in ice cream sounds downright decadent. Oh my high cholesterol (back of hand to the head dramatically). All this without chocolate! I think I am really primitive when it comes to Meringue. I didn’t know that people eat meringue with double cream cheese. It is already begining to intrigue me… salty creaminess with the sweet crunch of meringue… sounds brilliant! Holy …. you’re killing me! That looks and sounds like the most divine concoction. Have you ever just put dulce de leche on meringue? You think you’ve reached heaven just before you fall into a sugar coma! I make a dessert of meringue, dulce de leche, chantilly and strawberries. I bet the dulce de leche with the double creme on the meringue would be thorough ecstasy. Working my way through Sweet Life, and your descriptions of the French have brought me new understanding of my mother and grandmother- mom spent 1st 10 years of her life in Paris and grandmere many years and even in NYC they seemed to still think they were Parisians. I was always just embarrassed! Many a long NY movie theater line was handled in the most Parisian of customs. 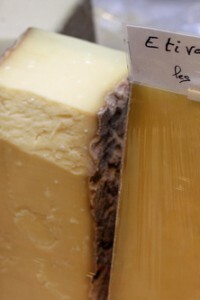 If you Ever make it back to Gruyere, visit the thursday Farmers Market in Bulle, right in the coeur of Gruyere. 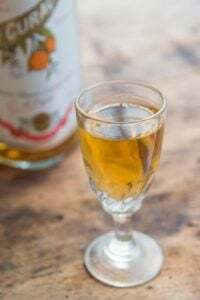 Thérè you will find freshly made caramels, wafers, artisanal anise cookies, meringues and room température Gruyere cream, the kind where they ladle it into those platic cups.. Dangers of attending school in Bulle- high cholestérol! Oh my heavens. I’ve grown up with pavlovas smothered in double cream, but I know that such delights pale in comparison with what you’re describing here. Be still my heart! Oh, Lord, do I love this stuff. 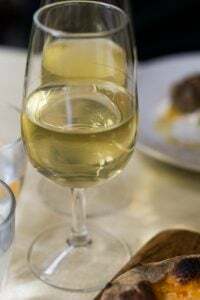 You can find it in a few restaurants in Geneva (for example, at Olé Olé in the Paquis, which mainly serves very unmemorable tapas). I was also told by Swiss friends that Movinpick makes a Double Cream and Meringues flavored ice cream. 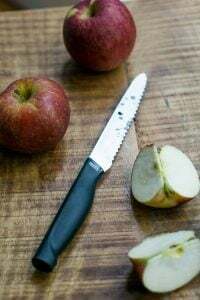 They said it’s great, but I personally would hold out for the real deal, both to savor the textures you describe — and as a way to eat less! Regina: I haven’t (yet) had or seen the ice cream, but I think eating this double cream straight up is the way to go (why dilute it?) But I might try it if I see it. Vivian: They do have wonderful farmer’s markets here in Switzerland with products from local farms and many organic items. Everything is so beautiful that I am bring a whole lot of things back to Paris with me. sararb1313: Glad you liked the book and yes, it’s funny how things like cutting in line are so ingrained. 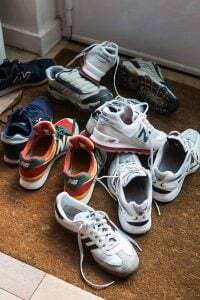 When I go back to the states and wait in line(s), it takes me a few days before I realize that I don’t have to do all the shuffling and moving from side to side to protect my place in line – because no one is trying to jump in front of me. markH: Of course, your absolutely right. I guess I’m just waiting for the right moment. Or incentive. Stefanie: Am happy you liked the book~ Thanks! Mm. Now I want to go to Switzerland. And I want to make my meringues the way those are made from now on. I have a magnum of champagne that’s just been waiting for the right event, and I think this post was it! 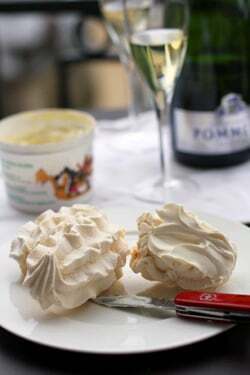 Meringues, double cream and ice-cold champagne this weekend… my family thanks you! We’ll include you in our toast. There is definitely something else to try in Gruyere, with double-cream of course, usually in the local shops around the village or in the Fribourg canton they serve coffee in a most delicious way : instead of getting your cup of coffee with a standard little plastic cup of 15% coffee cream, you get that little cup but made out of the best milk chocolate and FILLED to the brim with double cream. There is no point trying to scoop the cream out or letting it drip in your cup : just dunk it in! The best coffee ever! While you are still in the region, also keep an eye out for fresh gruyere-baked waffles (they are excellent with double cream) or “bricelets” : they are a bit like ice-cream cones rolled into thin-crunchy-baked golden cylinders, they are awesome with double cream and ice cream! Looks rather like the thick clotted cream sold from farms in Devon and Cornwall in the UK. A local habit down there is to put lashings of clotted cream on top of the ice cream in your cone. Decadent certainly, bad for the waistline but what can you do? Ignore the life work of all those pretty cows? Wow, this looks astonishing, I’ve never heard of Gruyere double cream before- but would love to give it a go. To an Australian eye and palate, this combination looks somewhat akin to our beloved pavlova- a classic meringue, cream, fruit combination- although the cream doesn’t have to be double cream- but that certainly looks like an improvement. Even the magnificent can be tweaked afterall. 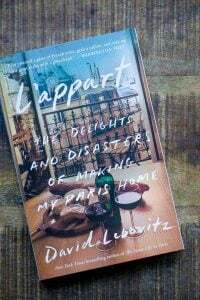 David…I just returned home from my first trip to Paris and loved it! People only cut the line in front of us at the Louvre so I think that we did pretty well. I am sure it was due to all of the wonderful and insightful information that I received from your blog before we left. Thank you! I feel like such a dope! When I see Gruyere, I think of a savory cheese, not realizing that it is a PLACE too! Doh! That looks like the perfect dessert to me. And eaten while in a fluffy robe! Lucky, lucky man. Thank you so much for featuring la creme de la Gruyere and its meringue – it’s all my youth packed in a jar! 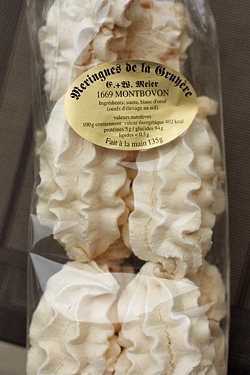 I was preparing myself to read that these meringues somehow featured Gruyere cheese – but I see double cream. If I hadn’t seen that picture of your swiss army knife standing up in it, I am not sure I would have believed it. This is something very different. Lovely! I’m told meringues and cream are what the angels eat, so I’m being very, very good because I want to go to heaven. WHERE DO YOU FIND DOUBLE CREAM IN PARIS? Maybe I cannot get the double cream gruyere (sigh) but I think I will run out and get a fluffy bathrobe and champagne. All I have to say is the Swiss are genius! I am booking a flight!!! It’s a cold and blustery spring day here in Sun Valley, Idaho. 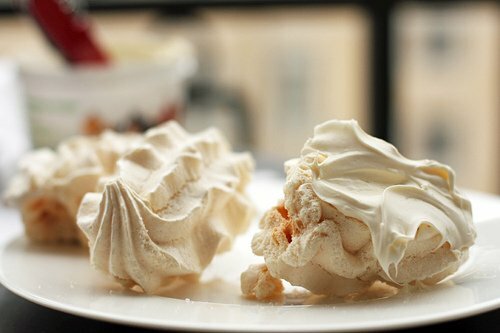 What could be better than meringues and double cream? Mmmmm…. My taste buds salute you. Oy! I am dying at my desk! Thank you so much for the brief mind vacations! I still dream of the Gruyere cream! Cannot be found anywhere but Gruyere. Think how much stress American cows are enduring: the proof is in the cream! 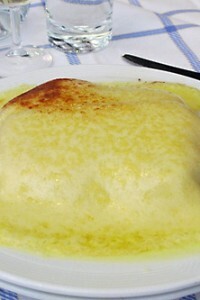 David, I could taste the Gruyère cream with you with you! I think I’d better mop off my keyboard from the drool. Magnifique! I’ve always been confused about doubling and tripling terminology and improvising equivalents here in the U.S…. Is La Gruyère double cream cultured like crème fraiche? Heated like clotted cream? Drained to thicken like mascarpone, which I think is considered triple crème? In your pictures the texture looks mascarpone-like. The link to the tourism site simply says “the cream skimmed off milk,” which is undoubtedly thick due to high butterfat, but I don’t think thick enough to be spreadable? On the other hand, as you describe, I searched online and found the pourable version, served in bowls for dunking. Thank you. It’s no Gruyère but I’m lucky to have lots of fresh raw milk to play with. You are one lucky person!!!! Delicious!!!!!!!!!! I never knew I wanted to visit Switzerland until I read this post. Double cream cheese + meringues?! I think I’m in love. Wow does this look good. And sinful. And totally worth it. I need to get my hands on some of this goodness! you are killing me, David! David — coincidentally, I happened upon the Movinpick ice cream today (for another month, at least, I am one of the lucky people who live above G. Detou!). The Eric Kayser on Montorgueil just opened an ice cream stand out front and they carry this flavor. I could not resist, but wish I had. Very underwhelming!! This … leaves me speechless. Good Lord! The description of the melting meringue and the leftover trace of sweetness and butterfat nearly did me in. To me, that is the description of heaven. Ahhhh, more sublime memories from my years in Geneve. Every time I read your blog I drool. I just drool. Double cream. Oh my. Oh wow, I don’t know what I’m craving more…the cold champagne? the Gruyere double cream? enjoying it in a fluffy bathrobe? wishing I was in Switzerland right now? How could you do this to me? Sometimes you just don’t know what you don’t know. I thought I’d tried every high-fat gustatory sin. This is a new one for me, and it sounds like the ultimate one. 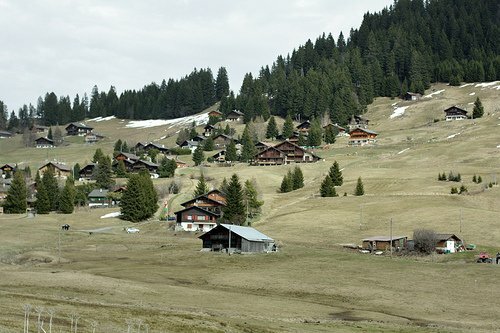 Talking about Swiss cows, have you ever tasted simmenthal beef? I don’t remember reading it in your posts (though maybe I missed it…). It’s unforgettable! I have a bad relationship with meringue, once I start I can not stop eating it. It’s the only food I have absolute no self control. 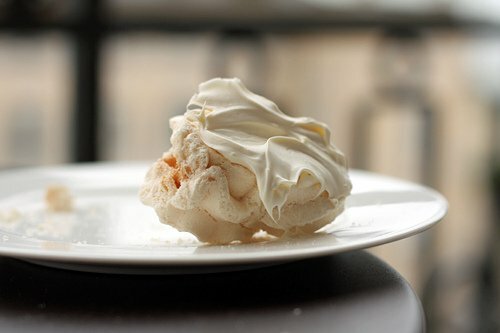 I can totally see myself launching around in my bathrobe in a hotel eating meringue with butter. Except, I can’t really. My life is so not luxurious. I Just eat meringues while watching cartoon on Netflix with my kids. It’s fun, but I need a vacation bad. I can not believe it. I am literally pondering how I can make a pilgrimage to Gruyere to eat what you have just spoke of. i have never been so jealous of another food blogger. I recently read your book; The Sweet Life in Paris and really enjoyed it. Thank you for sharing and keeping a light hearted humor about life. I do have a dear love for meringues, and pretty much all of their family members. when i read your post i could not believe my eyes. if you ever come across any US equivalent do let us know so I can have some shipped to phoenix. how decadent a dessert would that be topped with some stewed berries and a cup of espresso? ahhhhhh. again, so jealous. Holy dooley. I think I’m going to HAVE to go to Switzerland just to eat these. All the different types of food in the world never cease to amaze me! Thanks David! You always bring new, interesting foods to light. The paysan who lives next to my in-laws’ chalet in Vaud came by with some double crème from his cows, and then they went out an bought meringues. I had never heard of it before, and was regaled with tales about how rich it is. Sadly, they didn’t serve it while we were visiting, so I’m still a double crème virgin. L’Etivaz, on the other hand, I have had plenty of!